Decon Detergents – Kou Hing Hong Scientific Supplies Ltd.
With over 40 years experience in formulating and manufacturing surface active cleaning agents, Decon sets the standard for cleaning and decontamination around the world. Present their complete range of cleaning and disinfection agents, for laboratory, medical and industrial applications. The leading cleaning agent and radioactive decontaminant. Biodegradable, bactericidal, phosphate-free, non-flammable and totally rinsable, decon 90 provides the highest level of consistent and reliable cleaning and decontamination. A neutral pH cleaning agent, for safe cleaning and decontamination of sensitive materials which may be corroded, etched, degraded, discoloured or weakened by acid or alkali cleaning agents. A non-foaming liquid cleaning agent for use in all types of glassware washing machine. Acid rinse (neutraliser) and/or pre-wash (preliminary cleaner), for use in all types of glassware washing machine, in conjunction with main wash detergents. A non-foaming granular cleaning agent, for use in all types of glassware washing machine. Properties : decon 90 is biodegradable bactericidal, non-flammable, and rinses away completely after use. Formulation : An emulsion of highest quality anionic and non-ionic surface active agents, stabilising agents, alkalis, detergent builders and sequestering agents in an aqueous base. Supplied as a liquid concentrate, for dilution with water. Performance : decon 90 has successfully replaced the use of chromic acid mixtures in cleaning applications. Offering improved performance without the unacceptable hazards associated with the storage, handling, use and disposal of corrosive acids. decon 90 provides the ideal solution to the problems of achieving consistent and reliable cleaning/decontamination to the highest standard. Simple to use, economical and highly versatile, decon 90 is suitable for the most critical applications, combining remarkable cleaning and decontamination power with total rinsability and biodegradability. 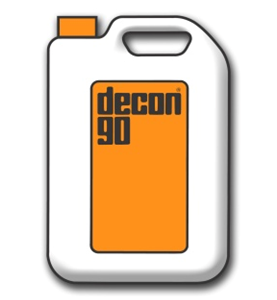 decon 90 sets the standard for cleaning around the world. It is used routinely in every major industry to achieve the optimum levels of cleaning/decontamination essential to modern sophisticated techniques. An essential aid to radioactive decontamination, decon 90 is widely used in establishments handling radioactive materials. use on non-ferrous metals, notably aluminium and zinc). 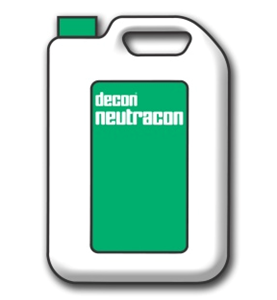 decon neutracon is a neutral pH cleaning agent, for the safe and total cleaning and/or decontamination of materials which may be corroded, etched, degraded, discoloured or weakened by acidic or alkaline cleaning agents. Properties : Biodegradable, non-corrosive, non-flammable and totally rinsable. Formulation : A precise blend of highest quality anionic and non-ionic surface active agents in an aqueous polyhydric alcohol base, producing a neutral (pH7+/-) concentrate. Supplied as a viscous liquid for dilution with water. Performance : decon neutracon has been specifically formulated to provide an effective neutral cleaning agent with maximum cleaning/decontamination properties which is totally rinsable and biodegradable. The concentrate dilutes without precipitation and may be used in hard water areas without causing the deposition of calcium or magnesium, or the precipitation of iron. Working solutions remain active, do not lose strength after use and will not redeposit suspended soils. They are thermally stable and do not absorb carbon dioxide from the air. Oils and fats are solubilised without hydrolysis or degradation. Applications : decon neutracon is formulated for cleaning/decontaminating all non-ferrous metals, such as aluminium, zinc, copper, silver, brass etc., ‘soft’ glass, coated lenses, polymer surfaces and other sensitive materials which must not be cleaned by acids or alkalis. decon decomatic is a liquid cleaning agent for use in all makes of automatic glassware washing machine, that dispenses liquid detergent during the wash cycle, as a main alkali wash.
May also be used as a pre-soak, prior to machine washing. Properties : Biodegradable, bactericidal non-foaming, non-flammable and totally rinsable. Formulation : A blend of highest quality amphoteric surface active agents, detergent builders, alkalis and sequestering agents in an aqueous base. Supplied as a liquid concentrate, for use in automatic glassware washing machines. Performance : decon decomatic has been specifically formulated to provide outstanding detergent and free-rinsing action for improved results from every type of automatic glassware washing machine designed to accept a main wash detergent in liquid form, with no adverse effect on the components of the machine itself. Effective against a broad range of contaminants, decon decomatic is very economical, providing exceptionally high performance cleaning, total rinsability and biodegradability. Applications : Safe and highly effective for cleaning/decontaminating glassware, ceramics, plastics (not polycarbonate), rubbers, stainless steel and ferrous metals. (being alkaline, decon decomatic is not suitable for use on non-ferrous metals, notably aluminium and zinc). Acid rinse (neutraliser) and/or pre-wash (preliminary cleaner), for use in all types of automatic glassware washing machine, in conjunction with main wash detergents. Formulation : A blend of highest quality aliphatic polycarboxylic acid, aliphatic alcohol and non-ionic surface active agent in an aqueous base. Supplied as a liquid concentrate, for use in automatic glassware washing machines. High grade ingredients selected for their non-foaming and free-rinsing characteristics, producing a product which is highly effective, totally rinsable, bactericidal and biodegradable. Performance : decon acid rinse improves the performance of automatic glassware washing machines by preventing the carry-over of traces of the main wash detergent, which may be alkaline or contain phosphates, and by inhibiting the deposition of lime salts from “hard” water supplies, on both the items being cleaned and the components of the automatic washing machine itself. Where contamination/soiling is acid soluble, a preliminary wash with decon acid rinse, using the pre-wash facility of the automatic washing machine, prior to the main alkali wash, is beneficial. Pre-wash is especially useful when cleaning apparatus contaminated with superficial greases, dried protein, iron hydroxide deposits etc. Applications : Safe and effective for cleaning/decontaminating glassware, ceramics, plastics, rubbers, stainless steel and ferrous metals. 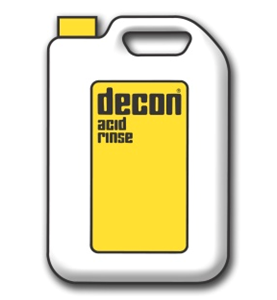 (being acidic, decon acid rinse is not suitable for use on non-ferrous metals, notably aluminium and zinc). dri-decon is a highly effective surface active cleaning agent, in granular form, for use in all types of automatic glassware washing machines that accept ‘powder’ detergents. For laboratory, medical and industrial applications. Properties : Biodegradable, non-flammable, non-foaming and totally rinsable. dri-decon does NOT contain enzymes, EDTA/NTA or chlorine bleaches. Formulation : A mixture of high grade surface active cleaning agents, alkalis, phosphate builders and sequestering agents in granular form. Supplied as a finely milled powder, for use in automatic glassware washing machines. A combination of powerful ingredients, selected for their non-foaming and free-rinsing characteristics combined with very high cleaning power to tackle the most tenacious contaminants. 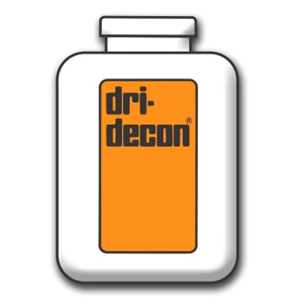 Performance : dri-decon is a highly effective cleaning / decontamination agent, specially formulated to give maximum performance with all types of automatic glassware washing machine, which use a main wash detergent in powder form. The potent cleaning action of dri-decon together with its solubility and free-rinsing characteristics ensures consistency and reliability of performance. dri-decon is safe and effective to use in all makes of automatic glassware washing machine, and has no adverse effect on the components of the machine itself. Used routinely, dri-decon is exceptionally economical and provides an ideal general purpose cleaning agent. Applications : Safe and effective for cleaning/decontaminating glassware, ceramics, plastics (not polycarbonate), rubbers, stainless steel and ferrous metals. (being alkaline, dri-decon is not suitable for use on non-ferrous metals, notably aluminium and zinc).